Make a splash at Adventure Bay Family Water Park located in the heart of Windsor. This indoor water park features over 35,000 square feet of wild water fun with five giant waterslides, FlowRider, wave pool, splash zone, lazy river and more. 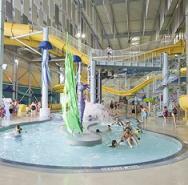 If the kids don't want to get wet, head to Cannon Cove, a three-level dry-land attraction full of fun. The park is available for birthday parties too!